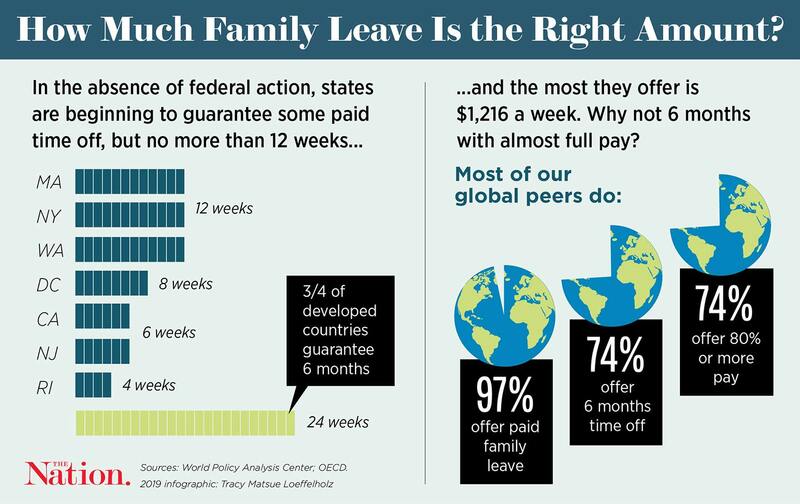 Even the paid-leave programs in the US that exist fall short of what’s needed. The year is still relatively new, but paid family leave is already a hot topic. A bill to create a state program was prefiled in Kentucky for this legislative session, and since January 1, similar bills have been introduced in Maine, Nebraska, North Dakota, and Vermont, with Colorado likely close behind. On the federal level, Senator Kirsten Gillibrand’s entrance into the 2020 presidential race ensures that paid family leave will be an important subject among the Democratic contenders, given that she sponsored a bill to create a national program. During the midterms, almost a third of competitive congressional candidates included it in their platforms. All of this energy is incredibly exciting in a country that, unlike nearly all of our peers, doesn’t guarantee paid time off to welcome a new child, care for an elderly parent, or undergo a long-term recovery of one’s own. But given the enthusiasm and the likelihood that some laws will get passed this year, it’s worth raising our ambitions. So far, the paid-leave programs that exist in six states and the District of Columbia fall short of what’s needed. While they’re certainly better than the zero weeks of paid leave in the rest of the country, the longest period that any of them guarantees is just 12 weeks; the rest offer between four and eight weeks. And all of them ensure that a worker receives merely a slice of her regular income, which is capped at a certain level; in 2018, the highest level was California’s, at $1,216 a week. Twelve weeks may sound like a lot to someone who is currently assured nothing, but it’s not the most effective amount. Research on maternal and infant health consistently shows that six months is the sweet spot for parental leave. For someone who gives birth, major organ systems take a long time to recover, and six months is when they’re typically back to normal working order. Also, postpartum depression tends to peak between two and six months, and for newborns, breastfeeding is most important in the first six months, which is also when most vaccines have to be given. Twelve weeks isn’t enough to reap these benefits. Economists tend to agree with the doctors. In a study of 17 countries with paid parental leave, two researchers found that up to at least seven months of paid leave results in benefits both to people’s incomes and to their likelihood of returning to work afterward. (People who take longer leaves may experience blowback from employers.) Six months is also standard in much of the world: Nearly three-quarters of the countries in the Organization for Economic Cooperation and Development guarantee new mothers that much paid time off. Replacing someone’s pay while they’re away from work is also important. In California, low-income workers have been less likely to take leave than those with higher incomes. This occurs at least in part because these workers can’t get by on the percentage of their pay guaranteed to them. Nearly a third of state residents who haven’t taken leave said it was because they wouldn’t get paid enough while off from work. Some cities and states have recognized these problems. In 2017, San Francisco mandated that employers supplement the state’s family-leave program so that workers get 100 percent of their wages for six weeks. California State Assemblywoman Lorena Gonzalez introduced a bill this year that would guarantee full wage replacement during leave for anyone making up to $100,000 a year. And the state’s new governor, Gavin Newsom, has proposed that families get six months of paid parental leave, although it would have to be shared between parents or other family members. Washington State Democrats tried to go even further: In 2017, they introduced legislation to guarantee that each employee in the state get six months of paid leave, but so far it hasn’t become law. Given that the only federal law mandating leave is for 12 weeks of unpaid time off, it may seem absurd to argue that 12 weeks away from work with some pay isn’t sufficient. But the country is hungry for action to address the decades that we’ve remained outside the international norm. We shouldn’t take action on paid family leave just for the sake of doing something; we need to get it right.